Frazer Ash, Digital Transfer Manager for Learning on Screen, reports on our off-air digitisation project and the valuable archive television content that will be made available in BoB. 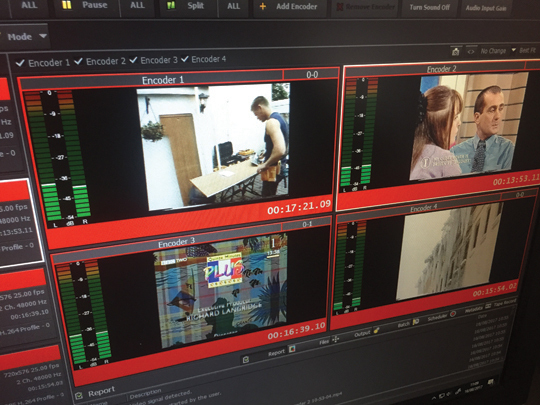 With over 1 million hours of UK television content spanning seven channels and ten years, it is fair to say Learning on Screen has the largest collection of off-air material available. Since 1998, through an agreement with the Educational Recordings Agency (ERA) under Section 35 of the Copyright, Designs and Patents Act 1988, the organisation has recorded the largely unbroken output of BBC1, BBC2, BBC3 and BBC4, ITV, Channel 4 and Channel 5, with More 4 added in 2009. These recordings form the basis of our Off-Air Recordings Back-up Service, which provides member institutions with copies of post-broadcast content for use in education. Roughly half the collection resides on tape, around 450,000 hours. Between the service’s inception and 2009, recordings were made using S-VHS tapes in D-VHS recorders, a combination that allowed 18 hours of continuous recording. Since then we have switched to Blu-ray recording, and will soon transition once more, this time to a purely file-based system, the same system that underpins BoB, our on-demand service for education. Adapting our recording methods in this way allows us to keep pace with evolving media formats, and so continue offering UK educational institutions unparalleled access to a wealth of rich and varied content. But recording is only half the process. We must also playback, and it is here we face a greater challenge. In 2016 the last Sanyo VCR rolled off the Funai production line in Japan, marking the end of the format’s near 40 year lifespan. Foreseeing this inevitability, Learning on Screen diligently stockpiled D-VHS machines in preparation. In addition, we acquired a significant stock of replacement heads for those machines, meaning any approaching the end of their usability (heads typically provide 1,000 hours of playback) can be rejuvenated as required. Yet even with these contingencies the collection lives only on scant borrowed time. When all the heads at our disposal are spent there’ll be nowhere left for us to turn. The solution? Preemptive digitisation. Our capture machine, digitising the files from our off-air VHS tapes. I am sure many of you are familiar with the sanity-taxing process of funding applications. It is a tough old game convincing those who could help you to do so, especially when you are unable to meet their own requests. And this, alas, was where we found ourselves. Given the collection’s nature, the fact that its contents remain under copyright, we are naturally bound by stringent terms. We cannot, for instance, charge for access, and can only make items available to UK educational institutions holding the ERA license. As a result, those who wish to either monetize it post-conversion, or, in the case of the Heritage Lottery Fund, make it accessible to the wider public, have built-in terms we are unable to meet. Again and again we encountered such issues, and though we continue to investigate other solutions, the time-sensitive nature of our goal eventually forced our hand. We decided to go it alone, undertaking the work in-house. Much of the workflow established with the aforementioned contractor has been brought over to our own operation, give or take a processor or two. 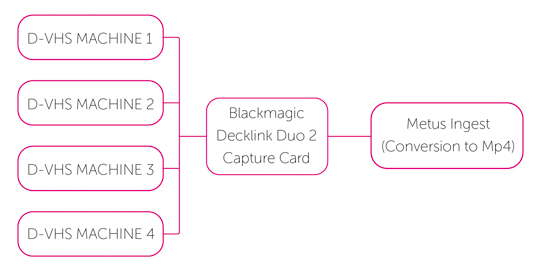 You can see the workflow in the chart pictured. A schematic chart of our digitisation process. The defining difference between this and the out-sourced version is scale. To be specific, the contractor with whom we planned to work with was capable of incorporating 40 of our D-VHS machines at any one time. This would allow the entire collection to be digitised within just four years. Comparatively, in house, with the resources presently available, we are due for completion in 2055. Yes, you read that correctly. 38 years. Longer than VHS itself was in use. Oh what a difference a machine or 36 make! Yet despite this discrepancy, we remain upbeat. Regardless of the timeframe, which may yet be reduced should other opportunities present themselves, work has begun. With each passing tape we secure a little more of this valuable collection, and while today’s storage methods are not without their flaws, the digitisation of this content vastly improves its manageability, allowing for easier transfer when more robust methods arrive. In the meantime, you may be asking, beyond preservation, what we plan to do with this content. Firstly, it’s worth bearing in mind that the resultant files will be anything from eight to seventeen hours long, depending on the tape. In order for us to make the broadcasts contained within them accessible we first need to extract them. This we will achieve using a custom encoding script which, in conjunction with programme data pulled from TRILT (Television and Radio Index for Learning and Teaching), can identify a broadcast’s in and out points. Having done so it generates and names a brand new file, leaving everything else in tact. These derivative files will then serve as the basis of the Off-Air service going forward, allowing for improved delivery times and methods, ultimately removing the need for physical media such and DVDs. More excitingly, however, each and every file will also be uploaded to BoB. Our aim is to provide our on-demand subscribers with a new week of broadcast content every month. That’s roughly 600 hours of historical programming, everything from news and sport, current affairs, documentaries, dramas, comedies, films and adverts. Even channel idents will be included. In effect, a BoB subscriber will ultimately be able to pick any date between May 1998 when the OARB service began and the present, sit down and watch an entire day’s broadcasts. The potential for research projects, student assignments and other uses is hugely significant. As for when this content will start appearing in BoB, we hope to carry out the first upload towards the end of September 2017. And rest assured we will be keeping you informed with regular updates through our website, mailing lists, Twitter and Facebook. In the meantime, if there is anything further you would like to know about the project, or should Learning on Screen be able to assist you in your own digitisation endeavors, pleased get in touch. We would love to hear from you!